My wife’s notebook PC recently died on us (luckily we had backups!) so we went shopping for a new computer. We considered tablets, but in the end we ended up going with an ultrabook (thin notebook PC). We had a coupon for the Microsoft store, and in the end I think we got a rather good deal. If only we had a student in the house, we could have received an xbox for free…not that I ever have the time to play any games. We had considered ordering a laptop from Japan so that it would come with the Japanese version of Windows and a Japanese keyboard. But doing so was out of our budget, and instead we decided to buy a US laptop and just use the Japanese IME from Microsoft. After a few days now, my wife is frustrated with the American English keyboard layout, just as I was when I lived in Japan and had to search hard for the quote mark key and the “@” mark on a Japanese keyboard. With time though, that annoyance goes away as you modify your muscle memory. To make her computer more Japan-like, I configured the tilde or accent grave key as the language switching key in the top-left corner of a Japanese keyboard. I could not completely make it Japan-like, however, due to a lazy Microsoft design flaw. Windows 7 has a major flaw that does not appear fixable. When switching to the Japanese IME, even if you have set “Hiragana” mode as the default, the IME always starts in Direct Input English mode. After much searching, a Microsoft support rep appears to have said, in summary, that it will only revert to Hiragana mode if you have a Japanese keyboard, and there is no fix for this. This is highly frustrating for anyone who has to switch between English and Japanese input. Prior versions of Windows did not have this issue (e.g. Vista, XP). The alternative appears to be setting non-unicode language default of the computer to Japanese, and then installing ATOK, the widely popular Japanese IME program in Japan. Hopefully this issue will be fixed in Windows 8 when it comes out (we have an upgrade coupon for that) if ATOK does not work. To prevent further breaches, the Pentagon announced Sunday it had ordered the disabling of a feature on its classified computer systems that allows material to be copied onto thumb drives or other removable devices. What a brilliant idea! Security auditors are always on top of everything… Perhaps one day business and governmental leaders will get it in their head that it might be worth a little extra to pay for security rather than taking on the risk of security breaches and dealing with the blowout. I happen to know for a fact that Mitsubishi-UFJ Bank in Japan has “dumb terminals” in many of their offices. “Dumb” terminals have no local storage and no removable storage like disk drives, and locked down USB drives–everything is done over the network, which can be audited and monitored in a central location. If a relatively small bank on the scale of world stage can do security right, why cannot the Dept. of Defense? Mr. Gates, it is time to get your money back from all of the defense contractors who sold you these systems and provided the private-sector security auditors. I bought a new printer today because I have grown tired of having to pay the office supply store $15 to fax a twelve page document or pay $0.15 per page for photocopying, which really does add up. I bought the Brother MFC-225CW, a machine with fax/copy/scan/print, all controllable by the computer over the wireless home network. As I unboxed the machine I started to feel the dread coming over me–how many hours would it take me to get this machine working? To my surprise, after following the quick-start guide step-by-step, I was able to get the printer configured and connected to the wireless network, and I even was able to print a document while sitting in another room. It all worked in one go! Just thought I’d share my moment of bliss, it probably won’t ever happen again. This year I have a couple of things I’d like to learn to do on my computer. The first is that I’d like to figure out how to edit home videos and create DVDs from the videos. The second task is that I’d like to create better language learning materials from podcasts and old cassettes. The latter seems much easier, so I decided to give it a shot today. While I find listening to podcasts or recorded audio for language learning is fun and interesting the first time, when I want to review the core material, I don’t want to fiddle with rewind/fast-forward, and I certainly don’t want to hear the hosts’ banter and idle chit-chat. What I want is repetition so I can practice getting the flow of the language. Unfortunately, many podcasts and many language learning materials don’t offer the repetition that I’d like, so I decided to take matters into my own hands. I found a free tool, Audacity, which offers the ability to chop up audio data into pieces visually on your PC or MAC. This tool is very easy to use–you do not have to be an audiophile or a computer expert to make use of it. I first played around with recording my voice from the mic, and seeing what I’d get on the screen. After fiddling with the settings, I saw that the tool can also use a PC or Mac built-in audio input jack to read an input signal. This is the same jack you might use for a hands-free headset or an external mic. I got out my old copy of Communicate in Cantonese, which is a great little Cantonese course that comes with an audio tape containing the dialogues, vocabulary banks, and audio exercises. While I don’t want the exercises for review, I would like to separate the vocabulary banks and dialogues into separate audio files so that I can listen to them for review whenever I’d like. I connected my cassette player’s headphone jack to my Mac’s input jack with a stereo patch cable. This will work whether you have an old walk-man (you didn’t throw yours out, did you?) or a cassette deck in your component stereo system. I clicked the record button in Audacity, and then hit the play button on the walk-man. After I had a few minutes of input, I stopped both. Using the play, pause and stop buttons in the software, I found the sections of the recorded input that I wanted to isolate, and I selected a section by clicking on the start position and holding the mouse down, not releasing it until I came to the end position of the section. From Audacity’s File menu, I created a new window, and in this window I pasted the previously selected data. For the dialogs, I pasted the selected data ten times, each time moving the cursor to the end of the previous paste-action such that the next “paste” would be appended. Once I was satisfied, from the file menu, I exported the contents of the new window to MP3, and voila, I was in business. 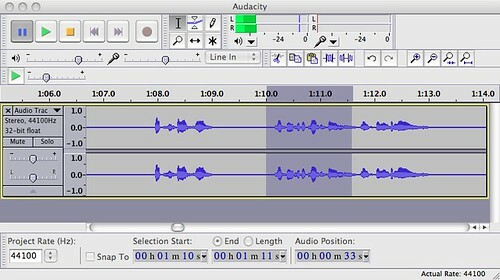 Skip this paragraph if you’re not interesting in the technical details, but for the curious: Audacity reads from a built-in mic or input jack and saves the data in pulse code modulated (PCM) format to a temporary file, which is simply the amplitudes of the input signal recorded serially in time. From this format, it is possible to export to many different audio formats, such as the ubiquitous WAV on Windows(and Mac) or AIFF for Mac. With the proper free plug-ins, it is also possible to save your files in MP3 or AAC encodings for your iPod, or any other popular encodings such as WMA or OGG. for language learners – if you’re very patient, you can try inserting gaps between sentences in a dialog so that you can repeat the previous utterance, or perhaps take a stab at answering the question in the previous utterance before the actual answer comes. While it does take time away from your study to make custom learning materials, I believe that we gain more from the ability to focus on the areas that of interest to us. While I’m commuting to work or even sitting at my desk and doing my job, I can listen to the dialogs passively as I won’t be distracting trying to rewind or fast-forward my language learning materials. Hopefully this will help make me more productive with my language studies this year.